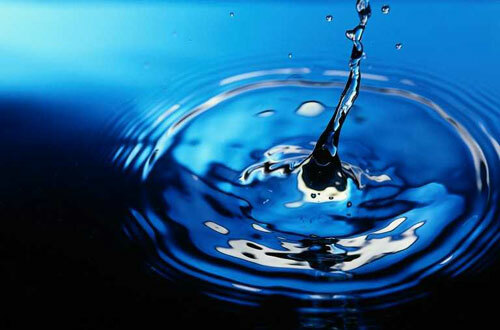 A drop disturbs the water’s surface, causing ripples to form. Water may be one of the most familiar substances on the planet, but it certainly isn’t ordinary. In fact, water’s unique chemical properties make it so complicated that even after decades of research, scientists still have much to learn about this remarkable and versatile substance. That’s water, as in the clear, sparkling fluid that covers three quarters of the Earth’s surface—not to mention the basis of life as we know it, and possessor of the world’s most recognizable chemical formula (H2O). Water is everywhere. And yet, scientists are still learning about its properties. Water simply doesn’t behave like other liquids. If you drop an ice cube into a glass of water, it floats. This happens because water expands as it freezes, which makes the solid form less dense than the liquid. But most other liquids do just the opposite; they shrink and become more dense as they freeze, so the solid form sinks. If water behaved that way, ice would accumulate on the bottom of lakes and oceans during the winter, and would have difficulty thawing in the spring. If possible, this would have consequences for aquatic life. Another surprising characteristic of water is that it boils at a very high temperature—100 degrees Celsius at sea level—compared to similarly sized molecules. If water behaved like other liquids, it would exist as a gas at the temperatures and pressures found on Earth, and life as we know it couldn’t survive.